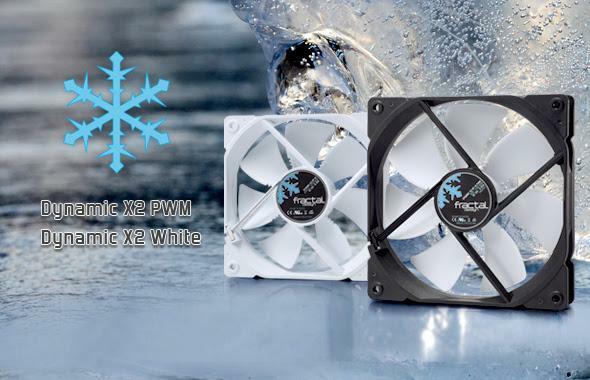 Fractal Design presents its latest cooling fan models under the Dynamic X2 and Venturi Fan series. The new additions to the Fractal Design Dynamic X2 are 120mm and 140mm variants with PWM support along with an all-white non-PWM variant of the Dynamic X2. The Venturi Fan series, on the other hand, gets four new variants in black and white colours. The Venturi Fan series will now include the High Flow (HF) and High Pressure (HP) models, both available in 120mm and 140mm sizes. The Fractal Design Dynamic X2 series are all-purpose fans now offering the option of either High Flow (HF) or High Pressure (HP) options to cater different needs of builders. The Dynamic X2 fans feature the LLS (Long Life Sleeve) bearing that offers up to 100,000 hours. PWM models have a range of 500 to 2000 RPM. The Dynamic X2 incorporates aerodynamic elements of airplane wing designs for significant noise reduction. Colour options include black, white and Fractal Design’s signature white blades and black frame. The Venturi High Flow Series fans, HF-12 and HF-14, are optimized for low-restriction airflow environments, making them an excellent choice for computer case fans, or other low-restriction usage scenarios. On the other hand, the Venturi High-Pressure Series PWM fans, HP-12 and HP-14, are optimized for high-restriction airflow scenarios, making them an excellent choice for use on large heatsinks, on radiators, or in other highly restrictive scenarios. 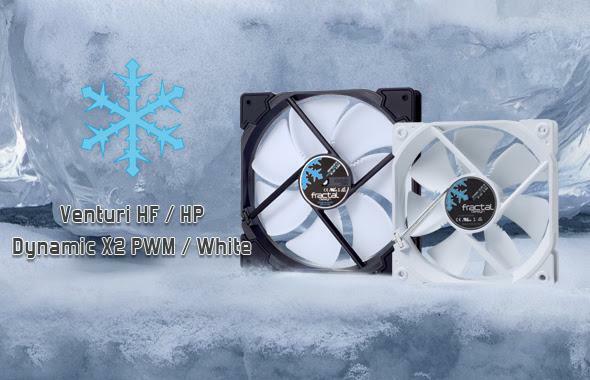 The Venturi series fans are available in multiple colour combinations including black, white, or the classic Fractal Design colour scheme with white blades and black frame.